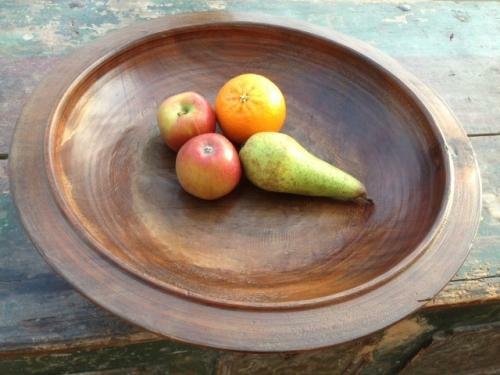 Wonderfully large antique Dairy Bowl. Heavily turned with attractive ridged wood turning marks and a flared turned foot to base. This is a large farmhouse bowl probably from turn of the century. I think it is possibly made of fruitwood as it holds a wonderful patina but is so tight grained. Would make a superb fruitbowl or centre piece to large farmhouse table etc.